I'm pleased to say that Mini Bite and Mr Bite are back to full health. Mini Bite, in particular, is eating to make up for lost time and it is sometimes difficult to fill her up. 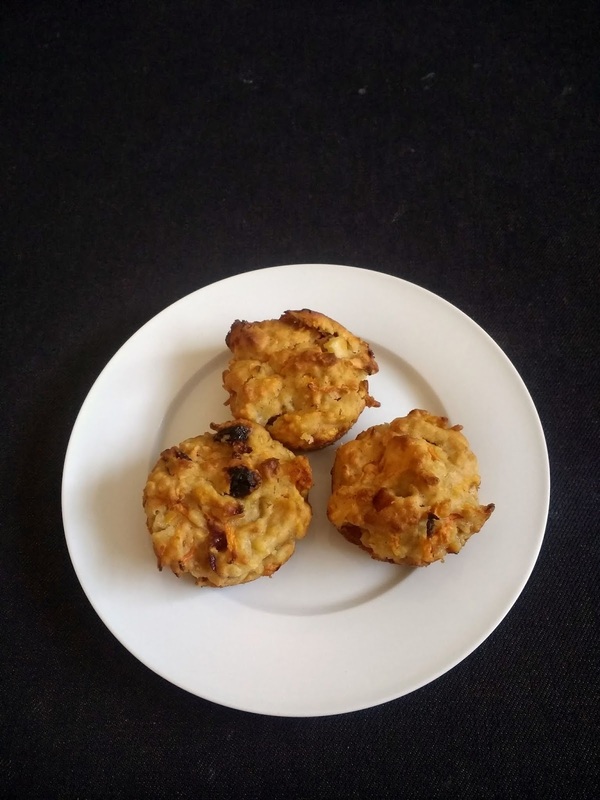 I made these muffins to help get us through days of meals, snacks and more snacks! We have also managed our long awaited first bike ride of 2018, and I hope to get out again this weekend. The weather is perfect for cycling and it is joyful to be on a bike again after so many months. Regardless of what you're up, these muffins make for good snacking or an easy breakfast. Unlike carrot muffins I've made before, these don't feature fresh apple but use applesauce as a sweetener. With a drizzle of fruit or maple syrup and a scattering of raisins, the applesauce allows the muffins to be sweet enough without packing too much sugar. My applesauce was sweetened but 100% apple varieties would give an even lower sugar result. I also used chunky apple sauce and enjoyed the texture this provided, with some soft apple pieces noticeable in the final muffins. However, smooth versions would be fine too. Of course you can use fresh apple in these - but for a carrot-apple muffin I'd refer to my 2011 recipe. Preheat your oven to 175'C (350'F) and grease a 12-pan muffin tray. Combine the dry ingredients (flour, oats, baking powder, cinnamon) in a large mixing bowl. Add the apple sauce, fruit syrup, oil, carrots and milk and stir through until fully incorporated. Fold through the sultanas or raisins. Scoop the batter into your prepared muffin tray and bake for 16-20 minutes, until golden and firm. I liked the look of these so much I thought I might make them tonight but have run out of energy - maybe soon! 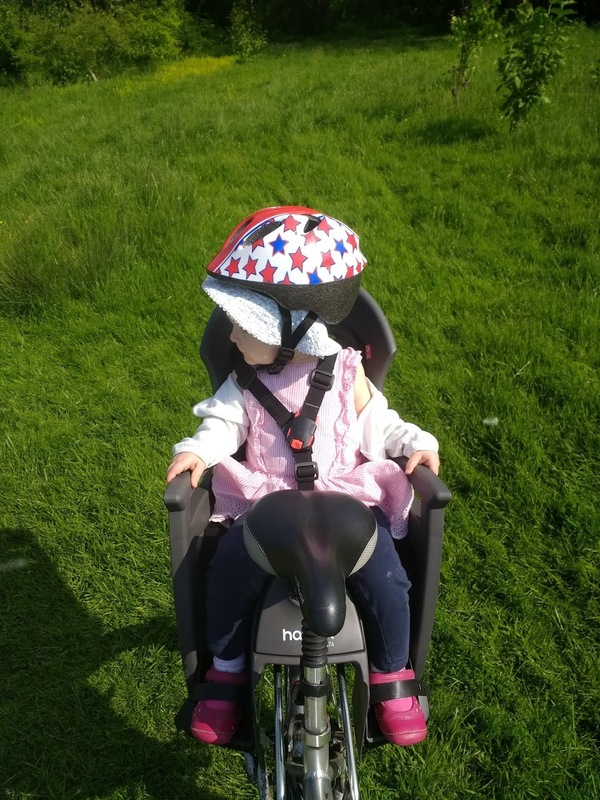 Mini bite looks very cute in her bike seat - hope she enjoys the long rides! She isn't so fond of long rides, but loves short to medium, and certainly prefers the bike to the buggy! I don't use apple sauce in baked good often, but I find it gives a really nice moist cake. These look fab, and I'll be giving them a try - they sound like they wouldn't be overly sweet, which really appeals. Hope there's more biking ahead too! Thanks Joey - they'd be a good snack for biking now I think about it! So glad to hear that everyone is well again. Mini Bite looks very cute on the bicycle. 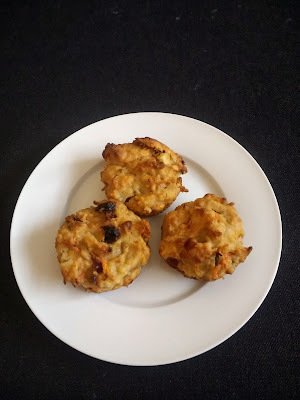 These kind of muffins are fab for lunch or as a general standby snack. English spring is so incredibly green. Every year I am amazed by it!